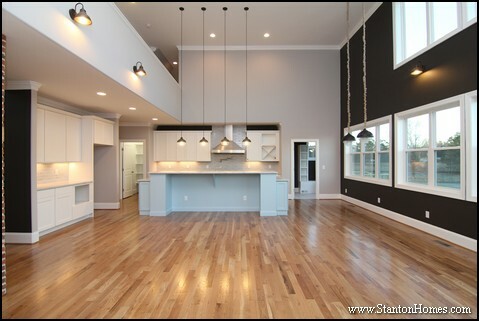 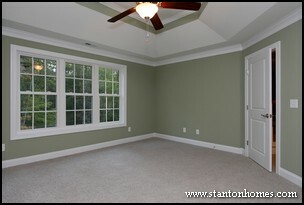 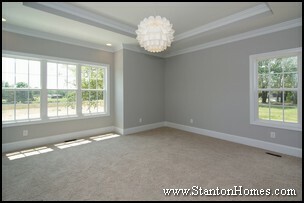 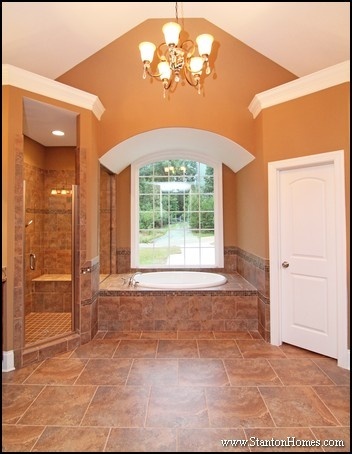 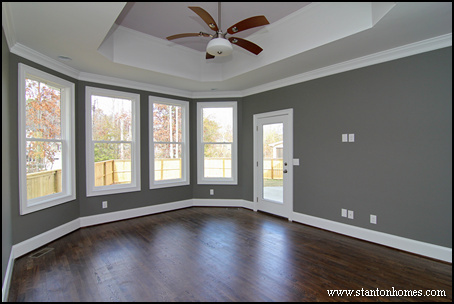 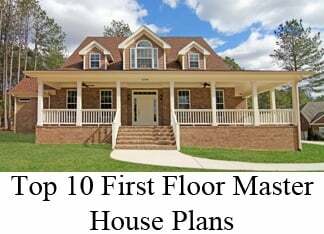 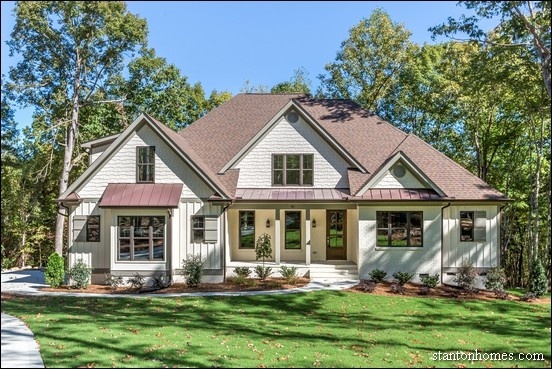 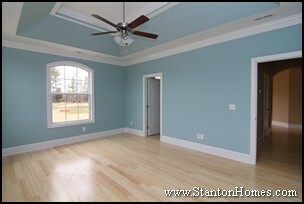 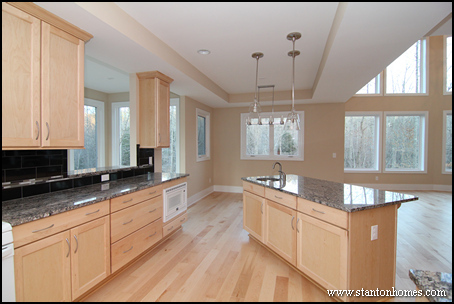 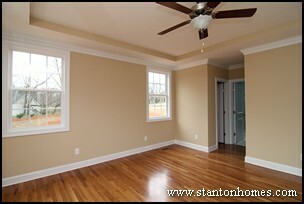 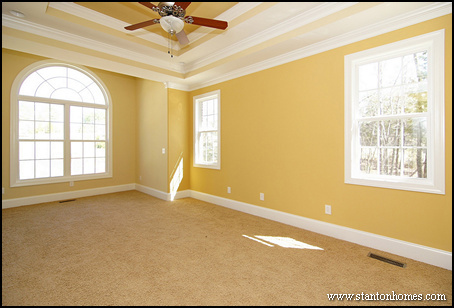 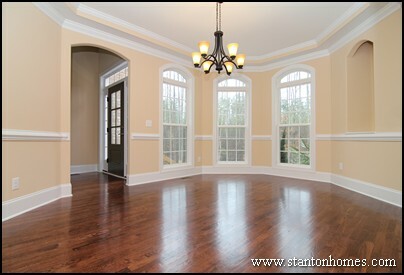 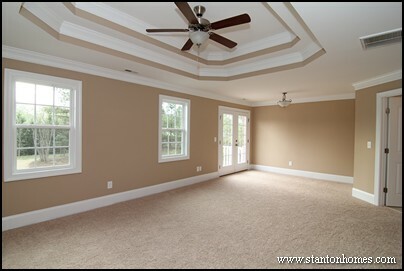 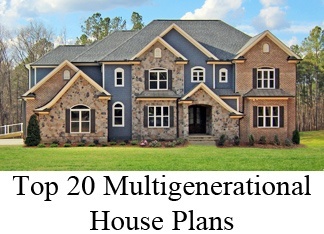 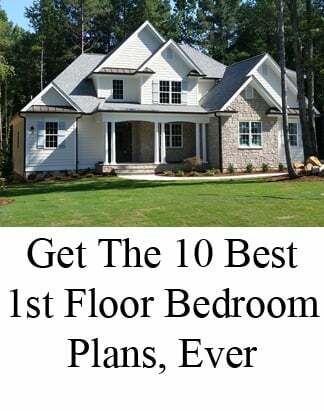 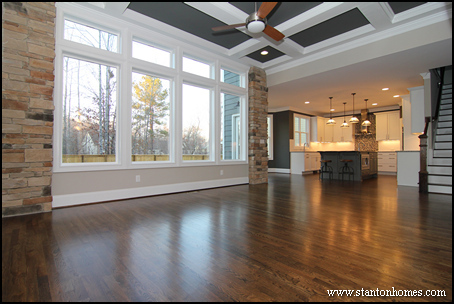 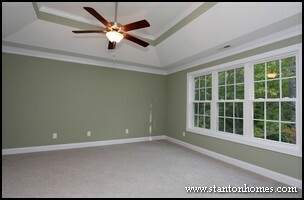 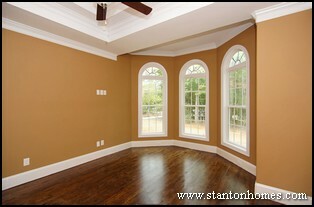 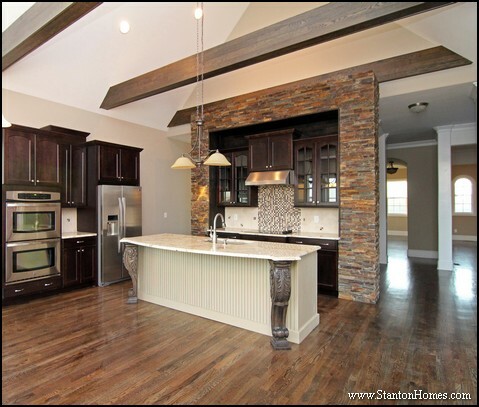 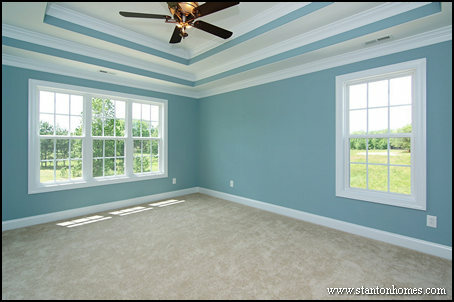 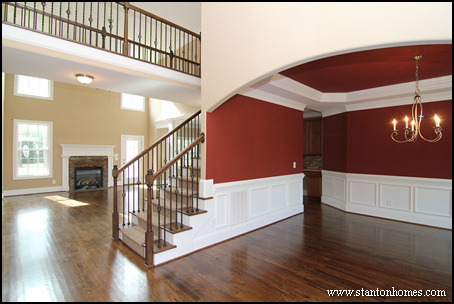 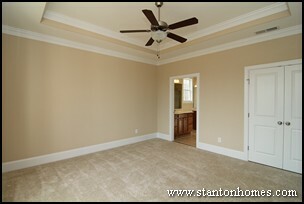 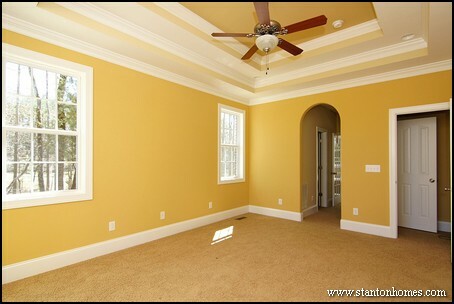 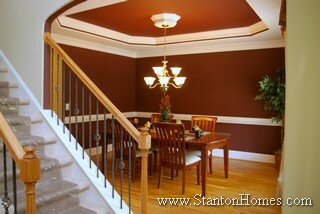 The most popular trey ceilings designed by NC custom home builder Stanton Homes will give you some great ideas! 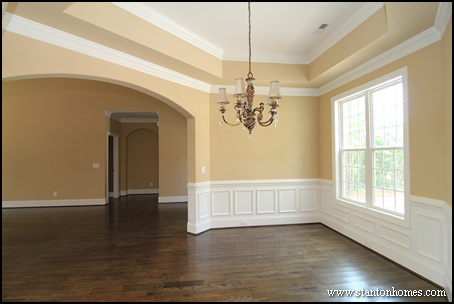 This dual step trey ceiling adds a tremendous amount of detail and character to the Formal Dining Room, without needing to take space from the rooms above. 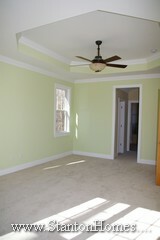 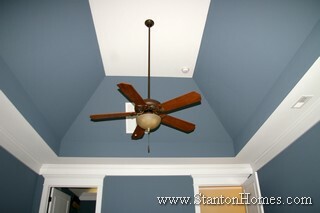 Color accents add to the fun in a trey ceiling treatment. 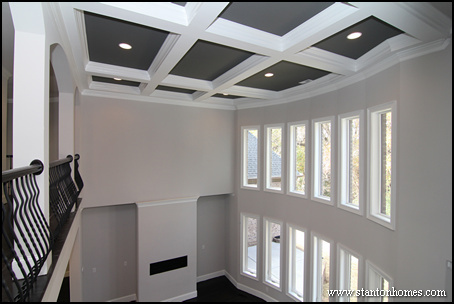 A beautiful focus point for any room, this trey ceiling idea includes an octagonal dropped feature that highlights lighting fixtures. 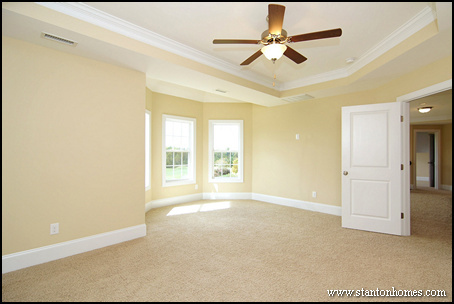 Custom colors used as accents on walls and ceilings add more drama – and when the center of the trey is a lighter color the additional dimension makes the room feel bigger. 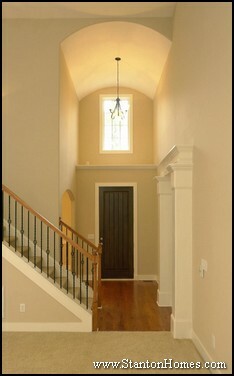 A stepped trey ceiling adds depth and dimension. 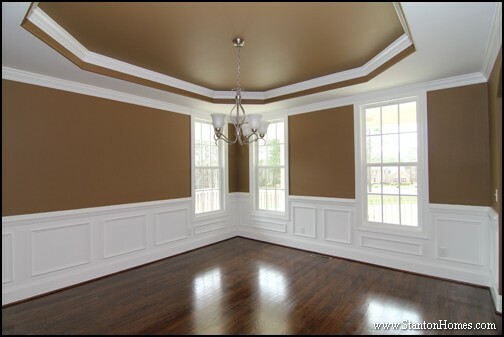 This trey ceiling treatment is perfect for the Master Bedroom, Dining Room, Study, or any other room you want to stand out. 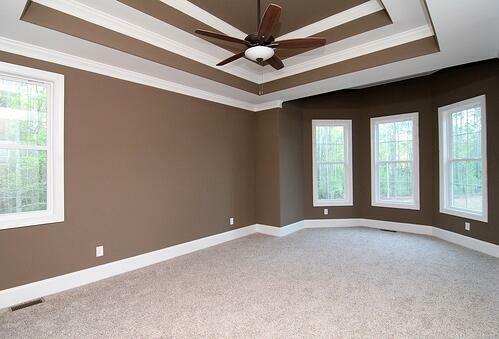 Notice how the accent color adds contour. 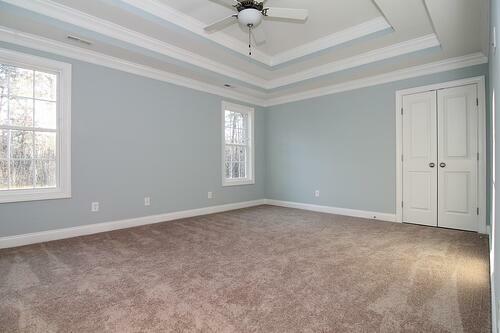 This trey ceiling makes the room feel more spacious. 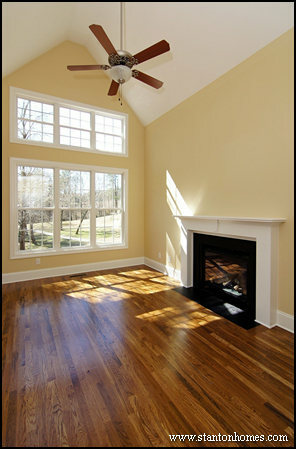 The trey is about 10" deep, with an appealing hexagon shape. 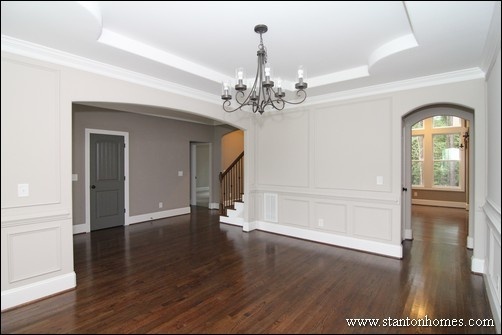 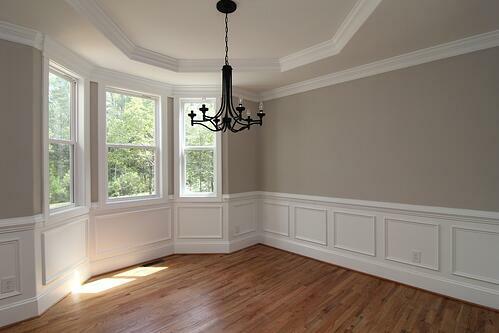 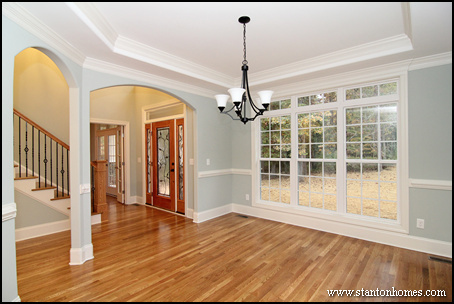 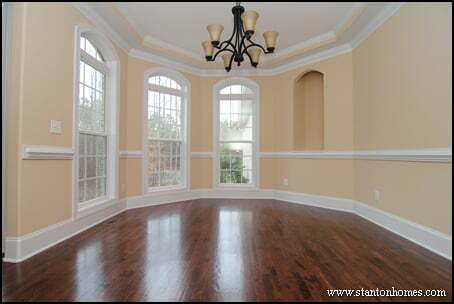 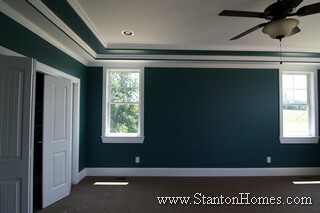 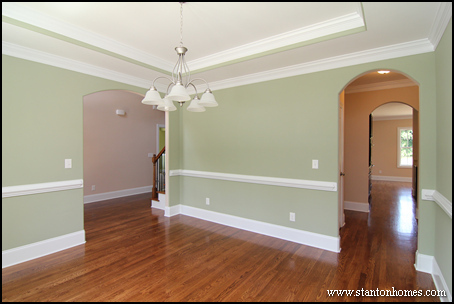 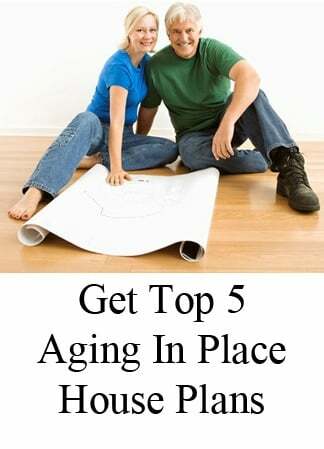 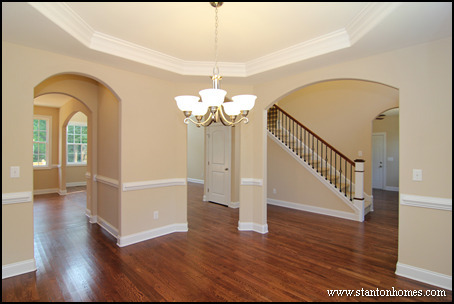 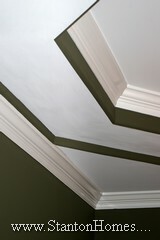 Crown moulding adds the finishing touch. If there’s space above the ceiling you can tap into, this 4' deep combination trey/vault ceiling can add character that sets the room apart as something special. 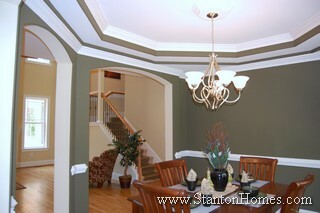 Accent colors draw the eye upwards, with a “wow” factor. 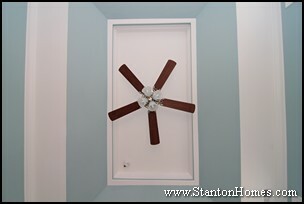 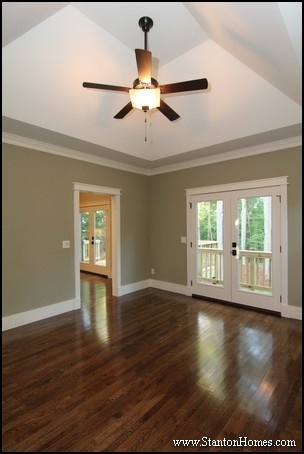 A ceiling fan takes center stage with a beautiful trey ceiling treatment like this. 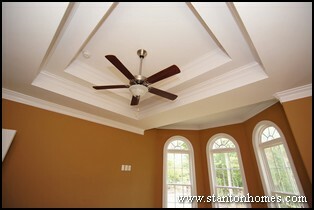 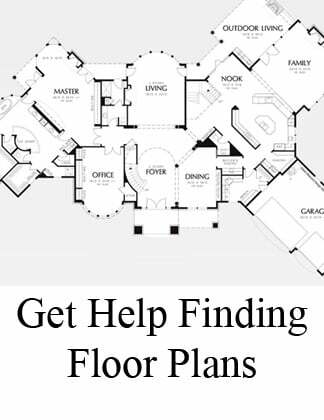 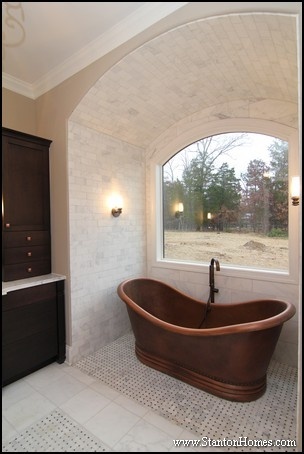 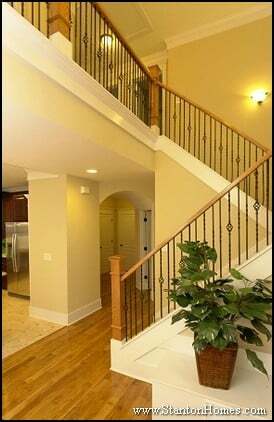 Top custom builders can design a trey ceiling just for you, with a huge variety of intricacies that make it special. 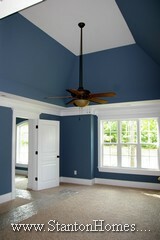 Discuss your trey ceiling ideas with your builder before framing begins. 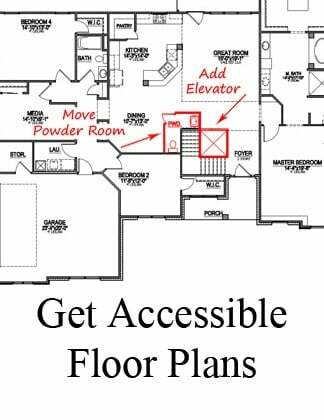 They will show you what’s possible, depending on the shape and size of the room. 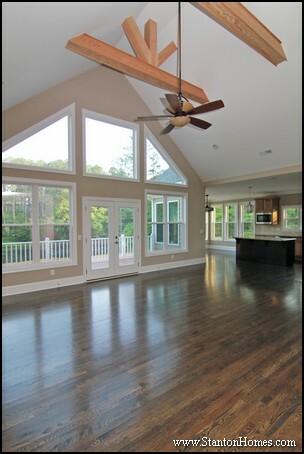 The maximum height of the trey ceiling will be determined by the structure of the home and space available above the room. 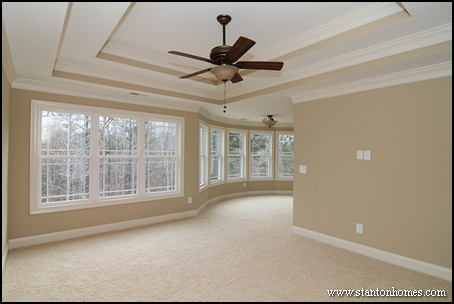 Enjoy designing your new trey ceiling – it’s one of the least expensive ways to personalize your new custom home, and make a special room even more inviting.